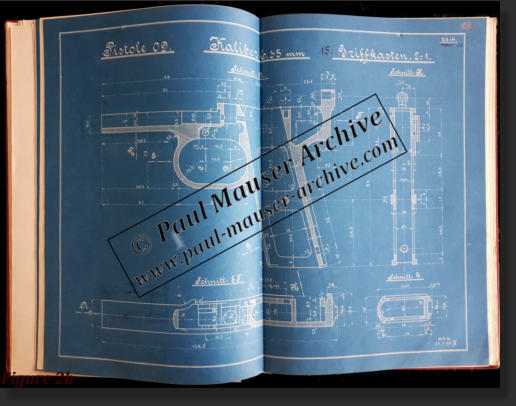 Paul Mauser Archive - Development of Mauser Firearms through historical documents. 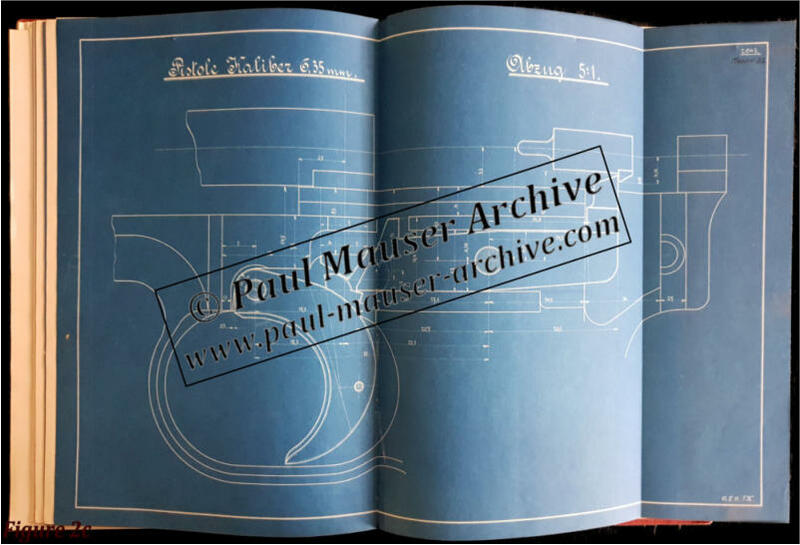 One of the most important aspects of the study of Paul Mauser and the early Mauser Archives is the ability to track the design genesis and production of Mauser firearms. 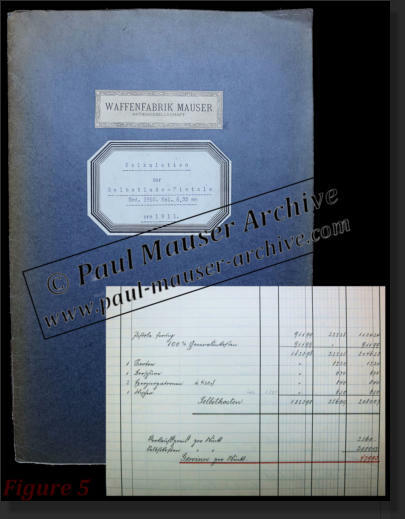 In general, it is possible to know when and who had responsibility for a project, why, and where the project work occurred within the Mauser facility. This is crucial to properly understand the story of a specific model. 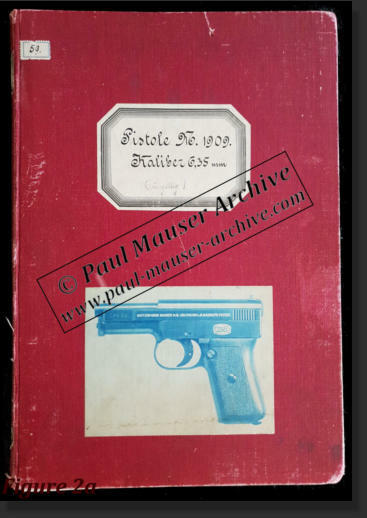 I suggest to those interested in reading with a great deal of detail such a story the book: Paul Mauser - His Life, Company, and Handgun Development 1838 - 1914. 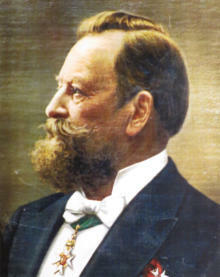 As example, consider the so called “pistol family”, introduced by Paul Mauser, Fidel Feederle and Josef Nickl in 1909-1910. The idea was to define a new design for a 9x19 Parabellum pistol and then scale down into smaller calibers. The reasoning behind this idea embraced the possibility of simultaneously competing in the marketplace by using the same design and patents for a wide scale of handguns including both the Parabellum and the smaller Browning 7.65 mm (.32 ACP). Below you can see several crucial historical documents that allow tracing the complete history of these new models. Figure 1. 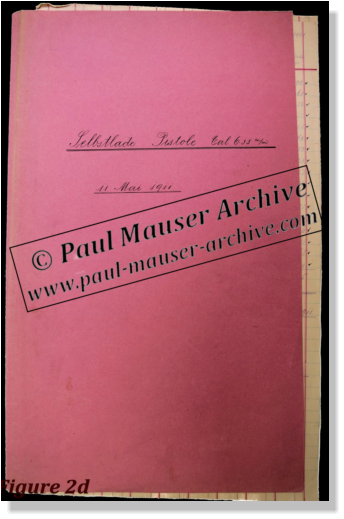 Early letters (1908) introducing the development of the new pistol family. The main competitor for small caliber handguns is indicated as Browning. 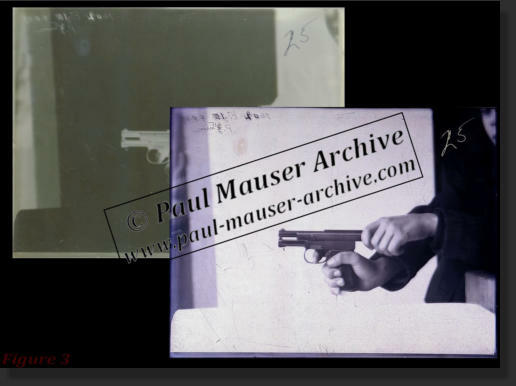 Paul Mauser had promised the German handgun test facility, the Deutsche Versuchs-Anstalt für Handfeuerwaffen, an automatic pocket pistol which was lighter than a Browning 7.65 mm pistol (the Browning 1900 model). The two letters exchanged between the German handgun test facility and Mauser discussed the concept and introduction of the new pistols. Figure 2a, 2b and 2c: Blue Prints Technical Book. 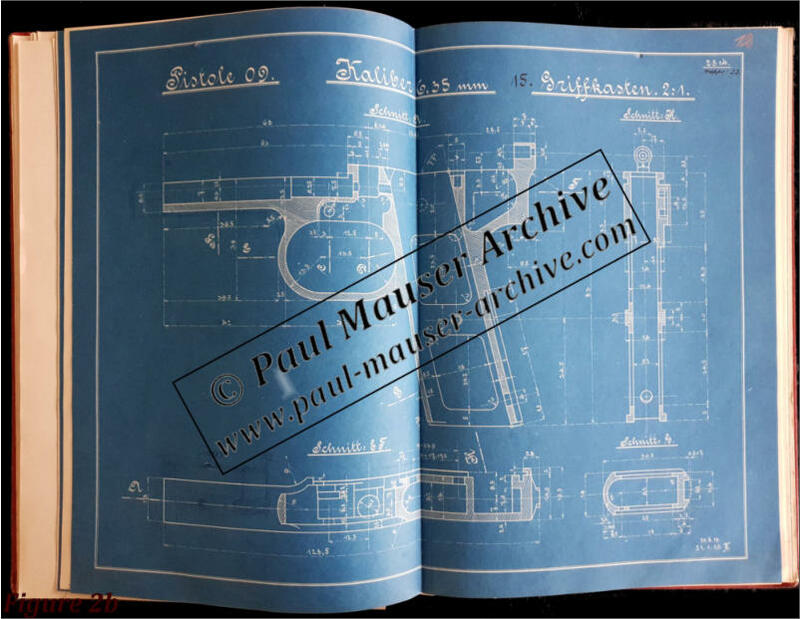 The most important technical documents are the blueprint and drawing books containing the complete set of blueprints designed for the pistols. It is a working document that also collected all the variations applied to the design. 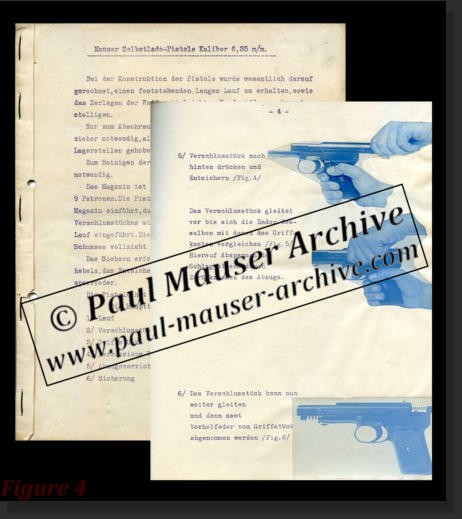 Additionally the documents mention the individual responsible for each single component of the pistol and in which Mauser facility the part is produced. Figure 2d: Additional drawings and technical notes are also collected in dedicated folders. Figure 3: Glass Plates Photos. In parallel with the development of the blue prints and drawings, parts and prototypes are developed. In this phase, glass-plate photos are taken of the different parts and prototypes. Here the negative and positive images are shown. The glass-plate photos are dated, providing crucial information about production timing. Figure 4: Assembly/Disassembly Manual. When product development reached a mature status an assembly – disassembly internal document was produced. Note that the positive from the glass-plate photos are cut and glued to the document. Figure 5: Cost Calculation Books. 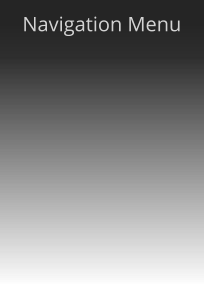 When the production was ready to start, the cost calculation is done. Specific model Cost Calculation Books are available describing the procedure used to evaluate the cost of the pistol. It is very interesting to understand how this was done. Figure 5a: Minutes of the Mauser Board of Directors meeting. The new pistol is presented to the Mauser Board of Directors. 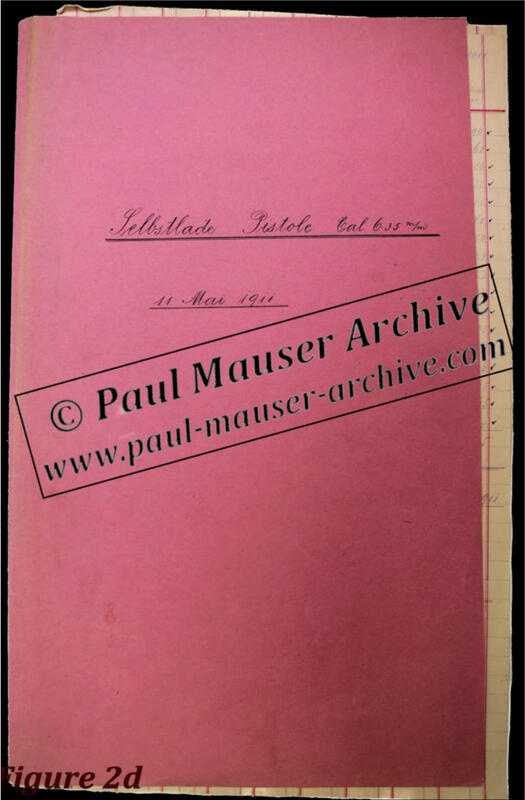 The internal Mauser minutes tracked the event. Figure 6: Presentation pistols. Presentations pistols, in some cases engraved models, are presented to magazine publishers and to very important people. 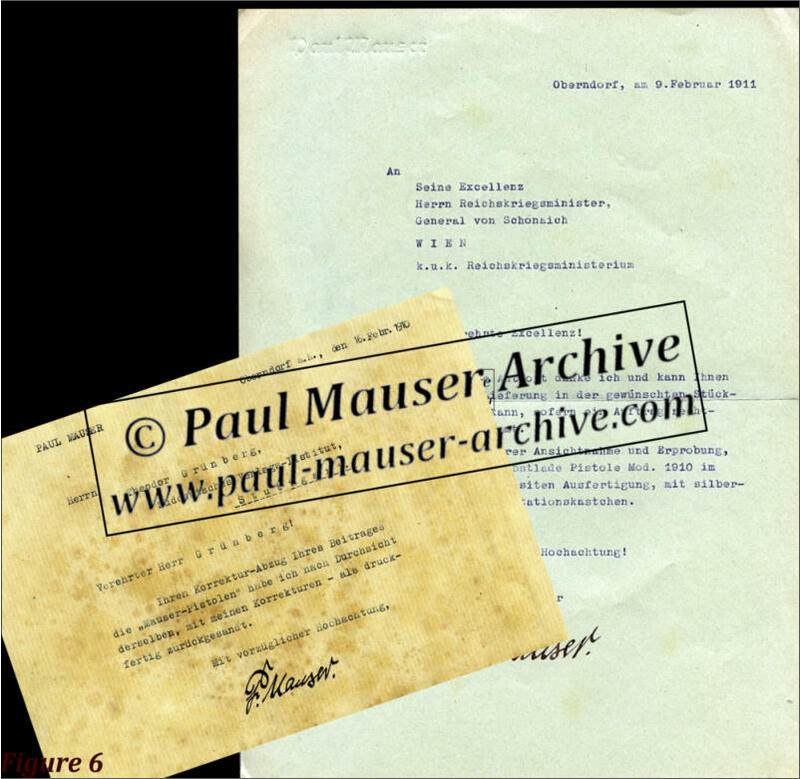 With the letter on the left, Paul Mauser referred to an article on the New Mauser Pistolen to be published. 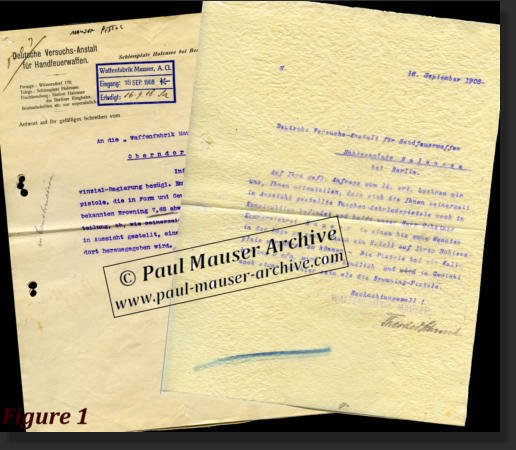 On the right is a letter from Mauser to the Minister of War of the Austro-Hungarian Empire, General von Schönaich. 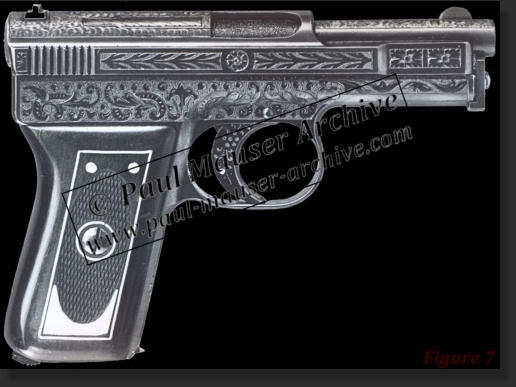 Mauser presented to the General an engraved pistol Mod. 1910 in box. Figure 7: Glass Plate. Every time a special pistol is produced, glass-plate photos are taken to record the event. 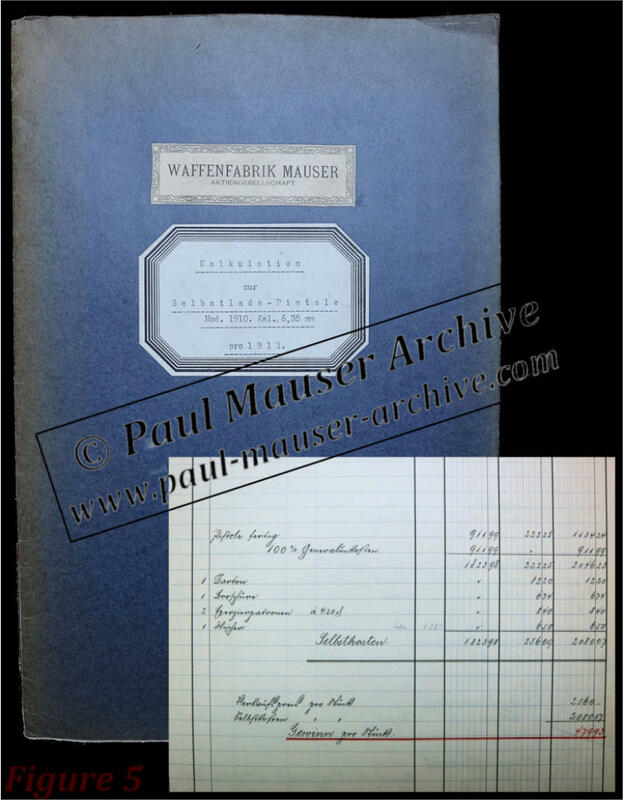 One of the most important aspects of the study of Paul Mauser and the early Mauser Archives is the ability to track the design genesis and production of Mauser firearms. 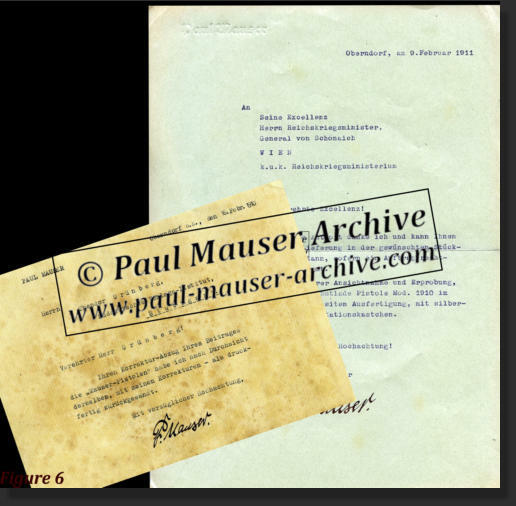 In general, it is possible to know when and who had responsibility for a project, why, and where the project work occurred within the Mauser facility. This is crucial to properly understand the story of a specific model. I suggest to those interested in reading with a great deal of detail such a story the book: Paul Mauser - His Life, Company, and Handgun Development 1838 - 1914. As example, consider the so called “pistol family”, introduced by Paul Mauser, Fidel Feederle and Josef Nickl in 1909-1910. The idea was to define a new design for a 9x19 Parabellum pistol and then scale down into smaller calibers. The reasoning behind this idea embraced the possibility of simultaneously competing in the marketplace by using the same design and patents for a wide scale of handguns including both the Parabellum and the smaller Browning 7.65 mm (.32 ACP). Below you can see several crucial historical documents that allow tracing the complete history of these new models. Figure 1. Early letters (1908) introducing the development of the new pistol family. The main competitor for small caliber handguns is indicated as Browning. 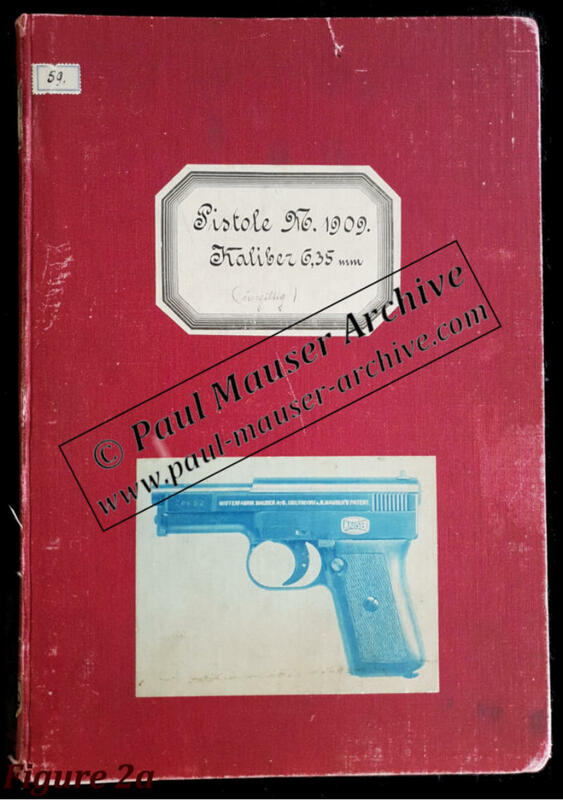 Paul Mauser had promised the German handgun test facility, the Deutsche Versuchs-Anstalt für Handfeuerwaffen, an automatic pocket pistol which was lighter than a Browning 7.65 mm pistol (the Browning 1900 model). 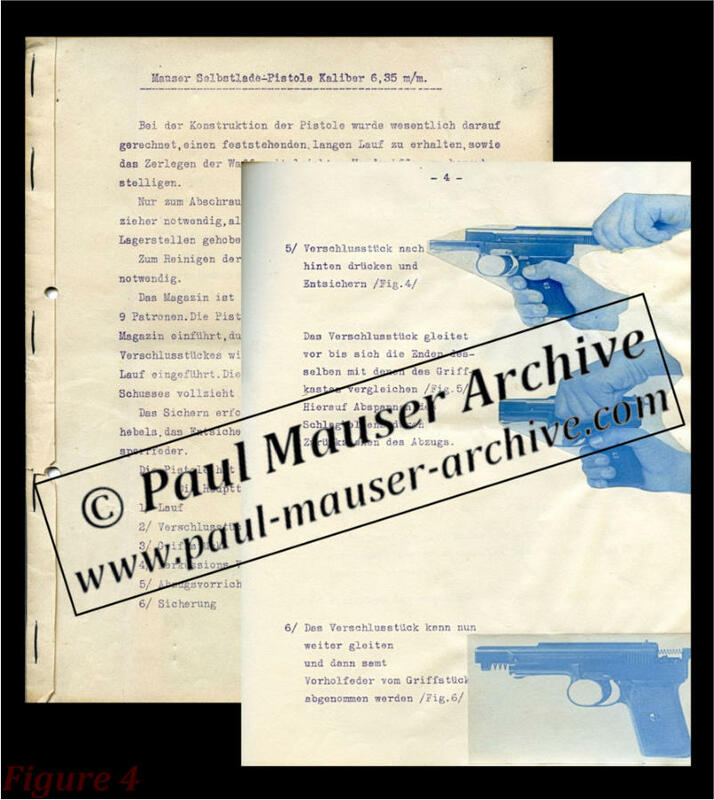 The two letters exchanged between the German handgun test facility and Mauser discussed the concept and introduction of the new pistols. Figure 2a, 2b and 2c: Blue Prints Technical Book. 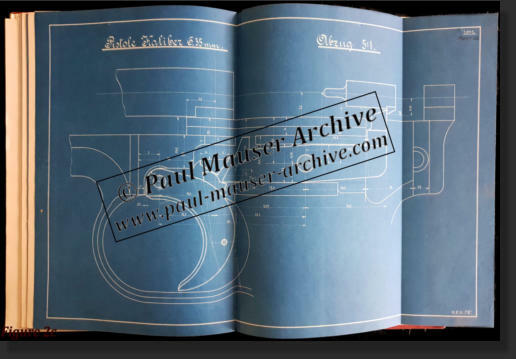 The most important technical documents are the blueprint and drawing books containing the complete set of blueprints designed for the pistols. It is a working document that also collected all the variations applied to the design. Additionally the documents mention the individual responsible for each single component of the pistol and in which Mauser facility the part is produced. Figure 2d: Additional drawings and technical notes are also collected in dedicated folders. Figure 3: Glass Plates Photos. In parallel with the development of the blue prints and drawings, parts and prototypes are developed. In this phase, glass- plate photos are taken of the different parts and prototypes. Here the negative and positive images are shown. The glass-plate photos are dated, providing crucial information about production timing. Figure 4: Assembly/Disassembly Manual. When product development reached a mature status an assembly – disassembly internal document was produced. Note that the positive from the glass-plate photos are cut and glued to the document. Figure 5: Cost Calculation Books. When the production was ready to start, the cost calculation is done. Specific model Cost Calculation Books are available describing the procedure used to evaluate the cost of the pistol. It is very interesting to understand how this was done. Figure 5a: Minutes of the Mauser Board of Directors meeting. The new pistol is presented to the Mauser Board of Directors. 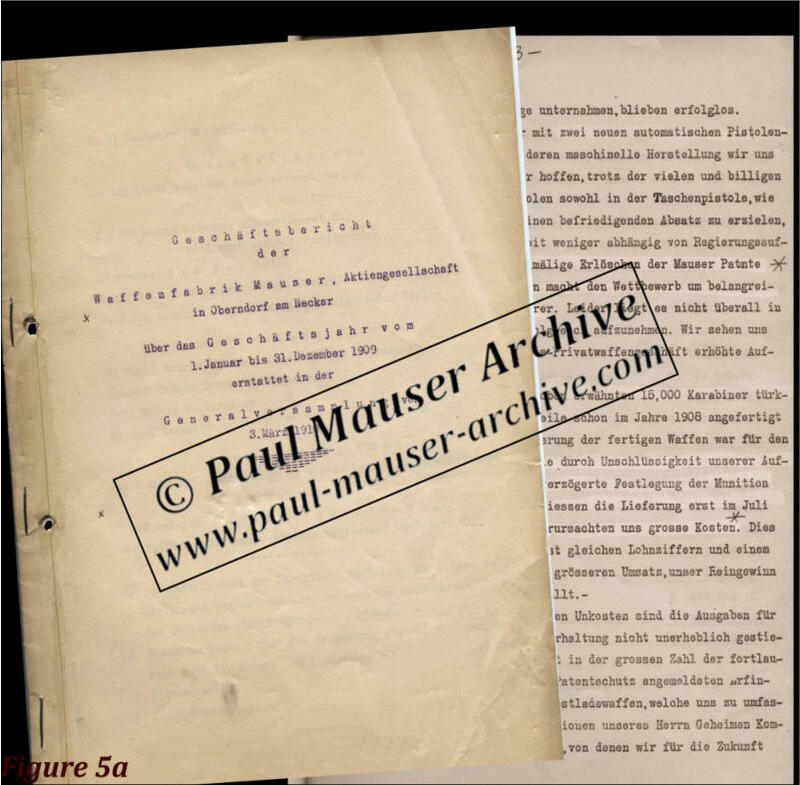 The internal Mauser minutes tracked the event. Figure 6: Presentation pistols. Presentations pistols, in some cases engraved models, are presented to magazine publishers and to very important people. 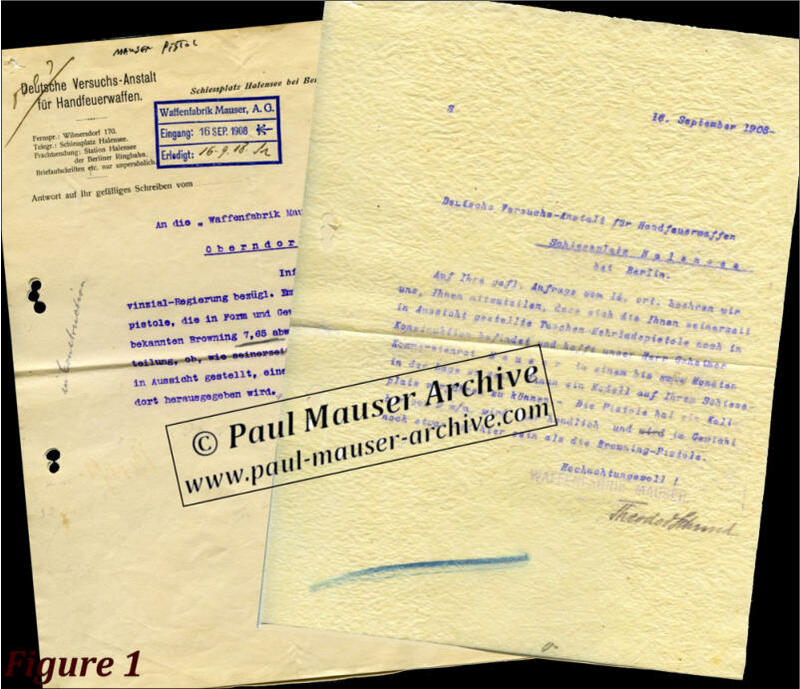 With the letter on the left, Paul Mauser referred to an article on the New Mauser Pistolen to be published. 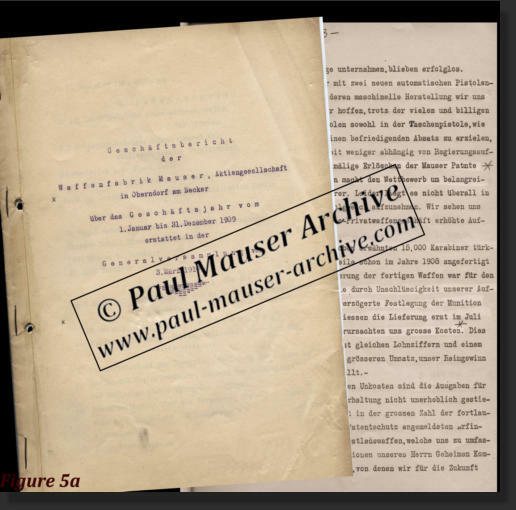 On the right is a letter from Mauser to the Minister of War of the Austro-Hungarian Empire, General von Schönaich. 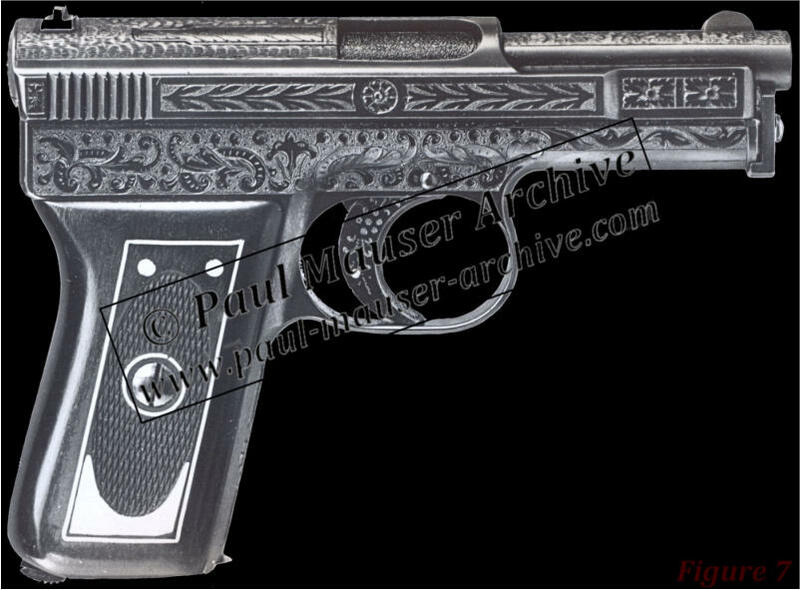 Mauser presented to the General an engraved pistol Mod. 1910 in box. Figure 7: Glass Plate. 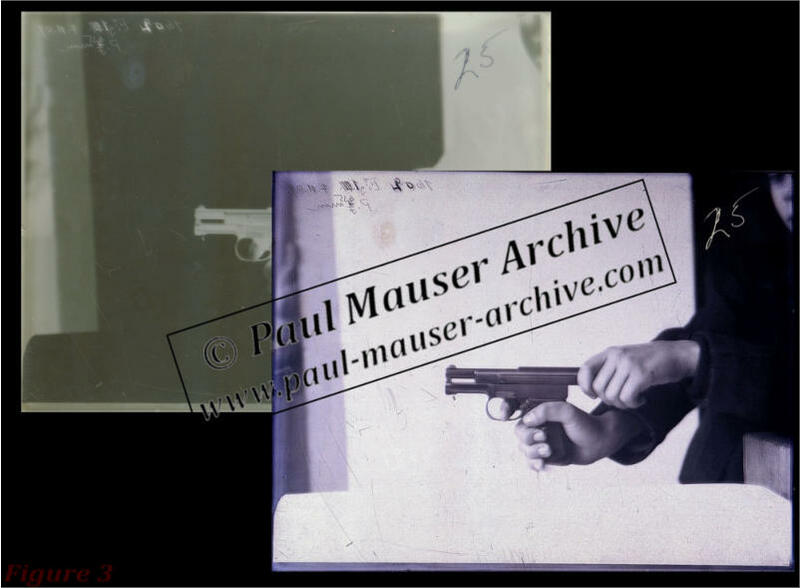 Every time a special pistol is produced, glass-plate photos are taken to record the event.